Race to Submit is challenging high schools in Riverside County to increase their Free Application for Federal Student Aid (FAFSA) + Dream Act submission rates and help students discover the financial aid available to them. These efforts have led to 15,150 applications submitted in 2014 to 20,132 applications submitted in 2016. The California Student Aid Commission (CSAC) has recognized these efforts and on February 23, 2017, voted to expand this competition statewide in 2018. Of the 13,204 CA Dream Act applications (undocumented students) submitted on time in 2016, 579 applications were Riverside County students. The federal government provides more than $150 billion in grants, loans and work-study funds each year for students to attend college or career school. Too much of that money goes unused. Graduating seniors from the class of 2014 in California lost out on $396,401,205 in federal Pell Grant funds in 2013-2014 because students failed to submit Free Application for Federal Student Aid (FAFSA) and the accompanying Cal Grant application. 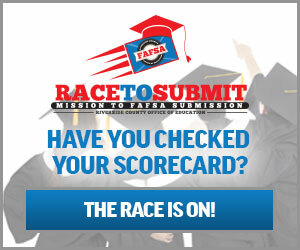 Race to Submit supports the goal of the Riverside County Education Collaborative (RCEC) to increase the percentage of FAFSA completions from 52% to 93% through school years 18-19. The RCEC is working with students, parents, school counselors, teachers, and principals to reach that goal together. Where does RCOE get enrollment data and what day of enrollment do you use? We use CALPADS enrollment data as of October 1 and then updated enrollment on March 2nd because students move campuses at the semester. We usually see only a slight shift (less than 20 students) per high school. Who do we call if the CALPADS enrollment is incorrect? Do you include Special Education, English Learner students, 5th year seniors, severely handicapped, undocumented students who do not even qualify for a Dream Act application, etc.? What students are included in enrollment numbers by high school, district, and county? We use total enrollment and include all students in our total enrollment listed as 12th grade students. We have researched enrollment data for all high schools in our county and when it comes to these special populations, they do not affect your completion by more than 5-8% so 90% completion is an attainable goal. For most high schools in our county, these populations affect their completion rate by 2%. Are you tracking completion or submission? What criteria are used to determine if a student is a completer or is listed on the dashboard? RCOE is tracking completion and not just submission. The state is tracking both submissions and completion but will award winners based on completion. The criteria used to determine if a student is a completer is an expected family contribution can be calculated and there are no errors or updates needed in a student’s application. 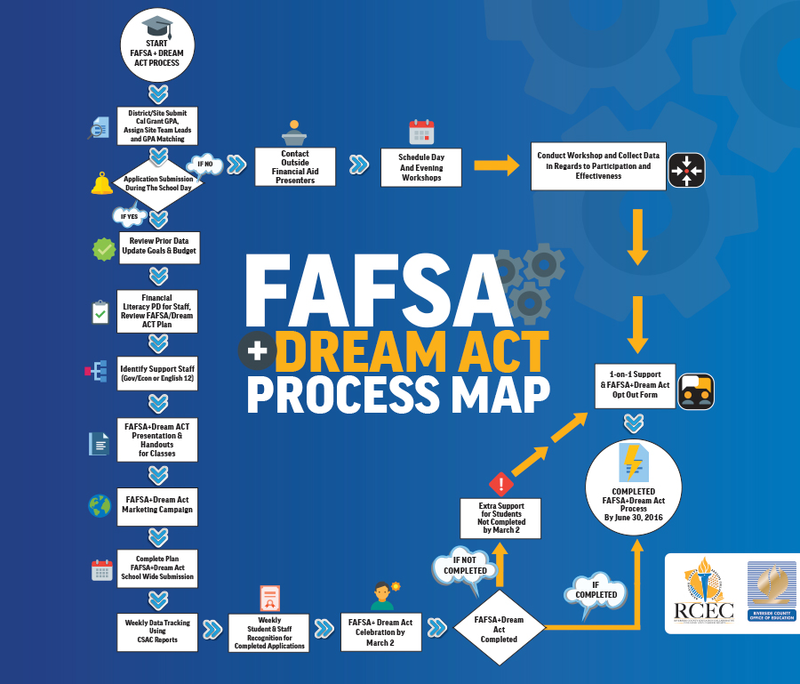 Do you track FAFSA and Dream Act applications separately? Both RCOE and CSAC are tracking both FAFSA and Dream Act applications and combining your total applications completed for the dashboards. Our student submitted a FAFSA but only listed out of state schools. Do we get credit for them? Student athletes that plan to attend an out-of-state college and did not list at least one CA school will not match on the CSAC report. It is always best for a student to list at least one California College on their financial aid application to activate their Cal Grant in case they return to California. A student can resubmit their application at any time and add a CA school. What reports can we use in CSAC to track completion and how often are these reports updated? CSAC updates these reports almost daily and you can visit http://www.csac.ca.gov/doc.asp?id=55 to learn more about the reports available. What are the categories and criteria to determine Race to Submit winners in Riverside County? What are the dates used to determine winners? We use March 2nd and June 30th as the two dates to determine winners. Our goal is to increase FAFSA/Dream Act completion from 52% to 93% by June 2019. This map shows an effective process schools can use to support and increase financial aid application completion. Parents stand to benefit significantly from having their student submit the Free Application for Federal Student Aid (FAFSA) and have an important role in helping students complete the process. These resources help parents be supportive of their student’s FAFSA submission, understand the process, and determine who does or does not need to provide income information. Are you ready to submit? Fill out the FAFSA now! Students need to know that there is money available for high school seniors to help pay for college and career school, but they won’t know how much they are eligible for unless they submit the Free Application for Federal Student Aid (FAFSA). FAFSA submission is required for all federal sources of financial aid and for state financial aid (Cal Grants). In addition, many scholarships, including those from colleges and universities require FAFSA submission. It’s a Race to Submit, and we are here to help! Fill out the FAFSA now! What is a FAFSA PIN and Why Do I Need One? Who Counts as Your Parent When You File Your FAFSA? Why is the Deadline for California Students to File the FAFSA March 2, 2015? The Riverside County School Counselors Network has compiled resources to help schools increase their student FAFSA submission and completion rates. Need a FAFSA document checklist? Curious about how other schools and communities increased their FAFSA submission rate? Need materials to promote FAFSA completion? Find what you need in the links below.